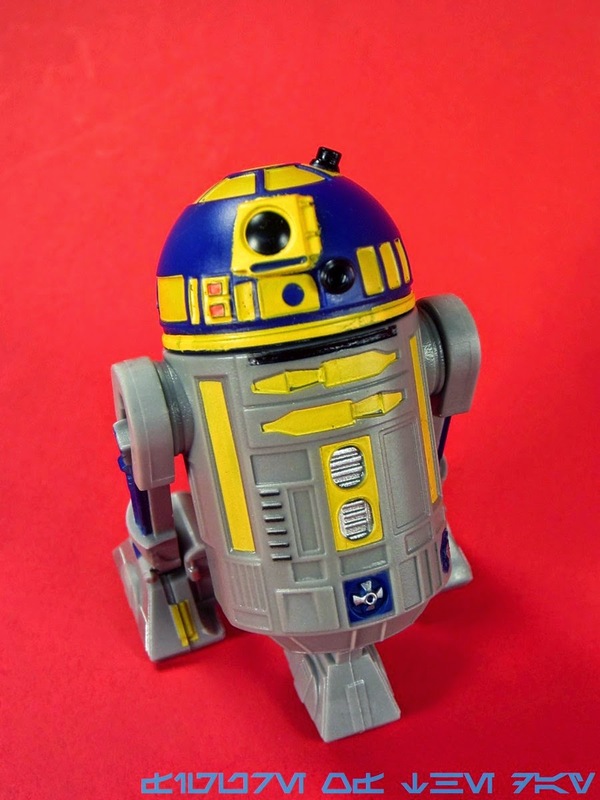 Commentary: This is a "realistic" version of R8-B7, sold as an R2-Series Astromech Droid at Disney parks. 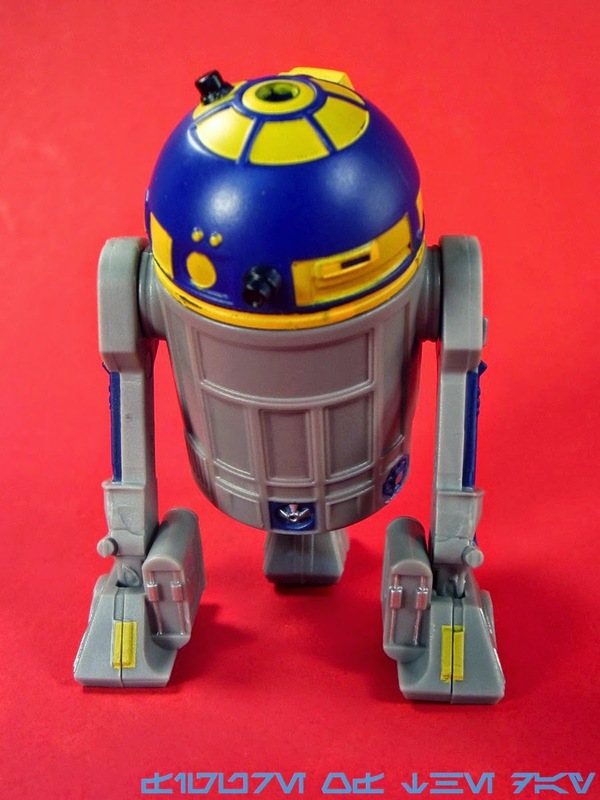 It's cheaper than the original animated release on the secondary market - although not by a lot - plus it's effectively a make-good on an unproduced Astromech that Hasbro showed us back in 2012 as part of the aborted The Legacy Collection redux. With a dark blue dome, the yellow plastic needs to be applied a little more thickly than usual to show up well - it more or less works. There's a little slop and some areas where the blue comes through, but other than that it all turned out pretty nicely. It's not the cleanest paint job - you can see some more overspray here than on others, thanks to the bright color of paint - but at least you can easily tell who this is supposed to be. The body of this configuration was retooled. The lower holes on the R2 body were removed, so you can't make a four-armed droid anymore. 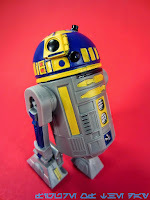 The grey plastic body has blue and yellow markings, most of which are painted well - light colors of paint on a black or dark plastic tend to show flaws more easily, and this is no exception. The back of the body is virtually undecorated save for one blue and silver design near the bottom of the body - there's not much there. All of the action is on the front of this one. Each leg is new - actually, it's only one leg. Disney had issues keeping enough matching right and left legs during the 2012 run, so I'm sort of happy that they found a clever solution to the issue. Each foot has been redesigned so it's the same on the front and the back. It combines elements from both the front and the back of the feet of the first ones, while retaining the wheels and dropping the wires. As such it isn't perfect, but it's pretty good. 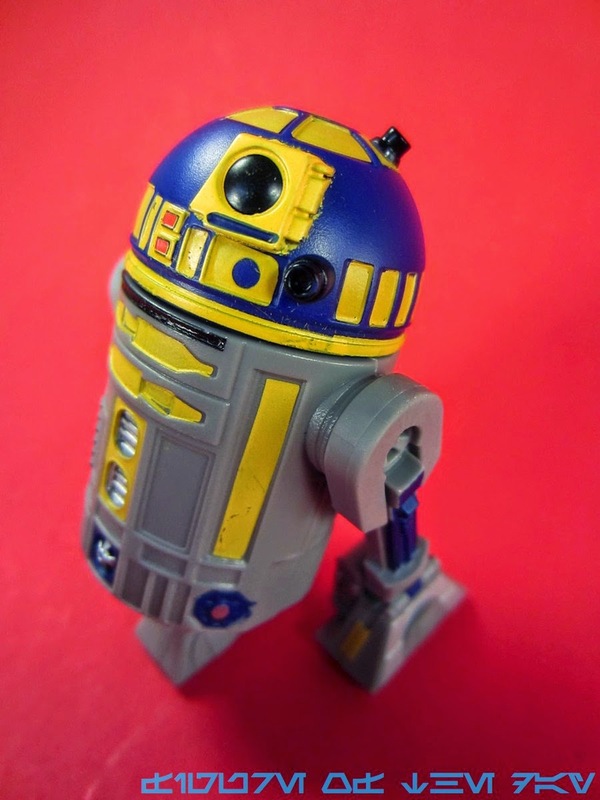 This pair of legs is grey plastic with yellow and blue highlights. I should also note that the arm was retooled so that the "rod" and "dots" on each arm have been removed and the "shoulder" has been smoothed out. It's worth noting that the foot adds an extra swipe of silver, and this wasn't present on the original version of the figure that Hasbro showed us back in 2012. The central grey foot for this (and all the other) colors is now unpainted, while the 2012 batch had silver markings around the bottom of the foot. The figure very closely resembles Hasbro's unreleased figure, save for the fact that it uses these newer molds instead - the yellows, reds, and blues are mostly exactly where they were originally. (Some flourishes were added to the legs.) 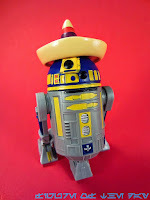 So if you are a fan of "lost figures," this one is certainly close enough to that missing astromech to fit the bill. This figure should go great with the Mace Windu in The Clone Wars armor released around the same time, and I'm pretty pleased to see more figures from the cartoons done up in the "realistic" style. I'm sure we'll never see everybody done that way - you can thank the cool clones and aliens for that - but at least we have one more to add to the stash. I'd suggest trying to examine these in person to see if you can find the best paint job, but for all I know this is as good as they get. 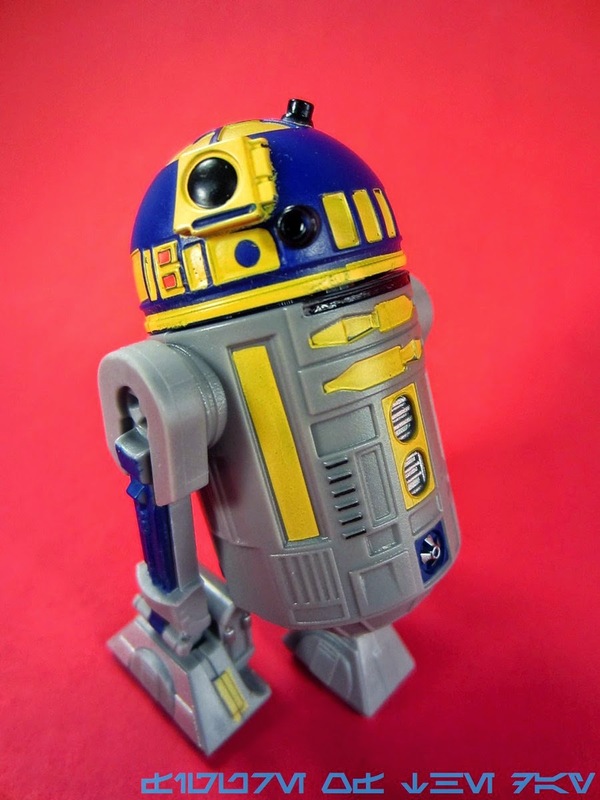 And that rounds out the first wave of Droid Factory 2015! Collector's Notes: I got this from my pal Shannon who was cool enough to get me a set from Disneyland. 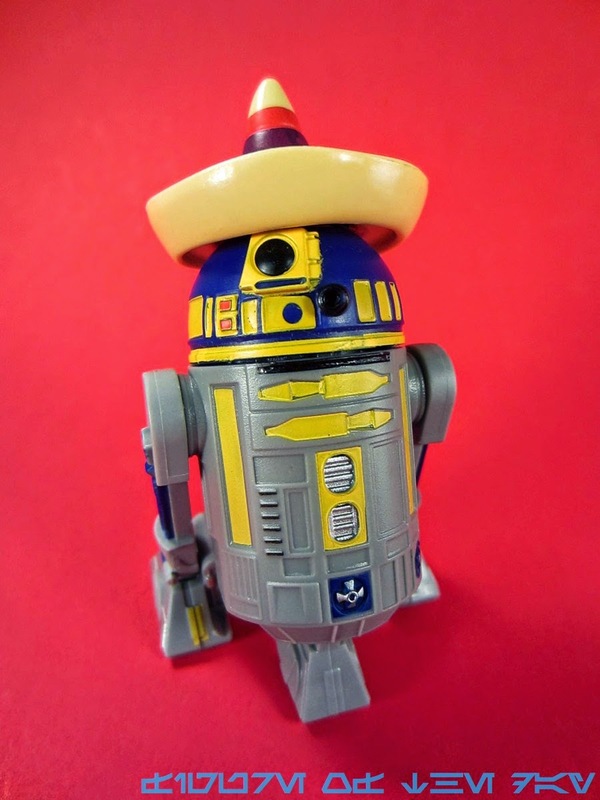 The "partner" from the unreleased 2012 wave of figures remains unproduced - that's R5-X2, if anyone is keeping track. 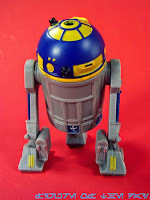 That droid was made by Tomy as an RC figure, but not as a traditional Hasbro action figure just yet. 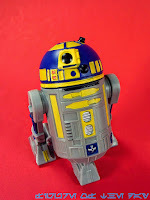 Wasn't there a combination in the first wave of Disney's Build-A-Droids that was nearly a dead-on resemblance of R5-X2 (Red R2 body with a white R5 head with red details)? Given this was already made, I think the chances are low that we'd see these parts again in the near future, don't you think?